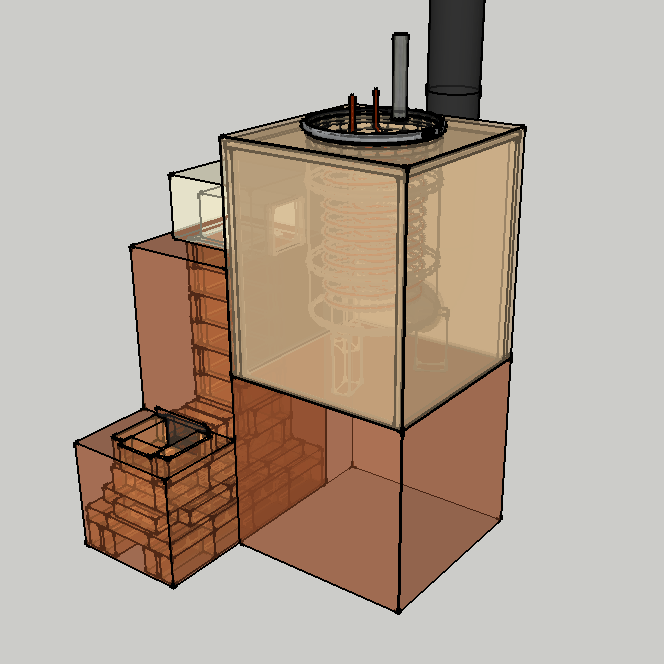 Hot Water | Rocket Stoves.. Experimenters corner.. Answers questioned! 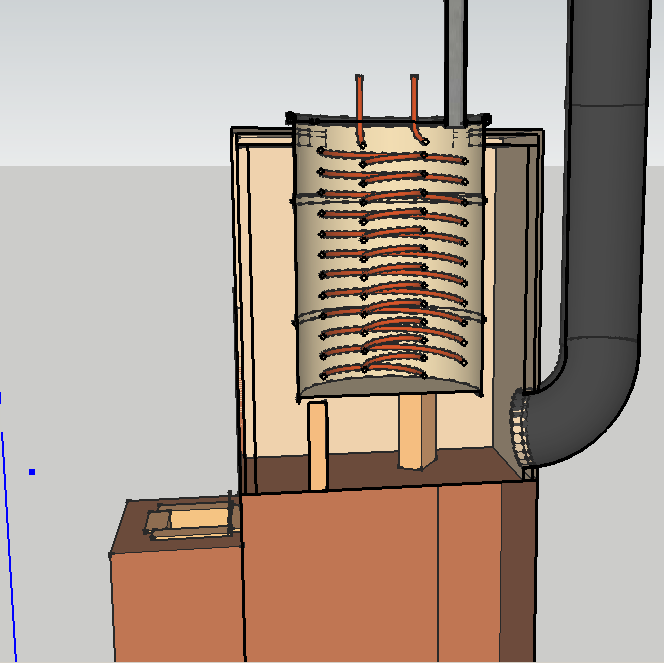 It's taken a while, but here's my concept for safe and relatively efficient water heating for showers and other domestic use. 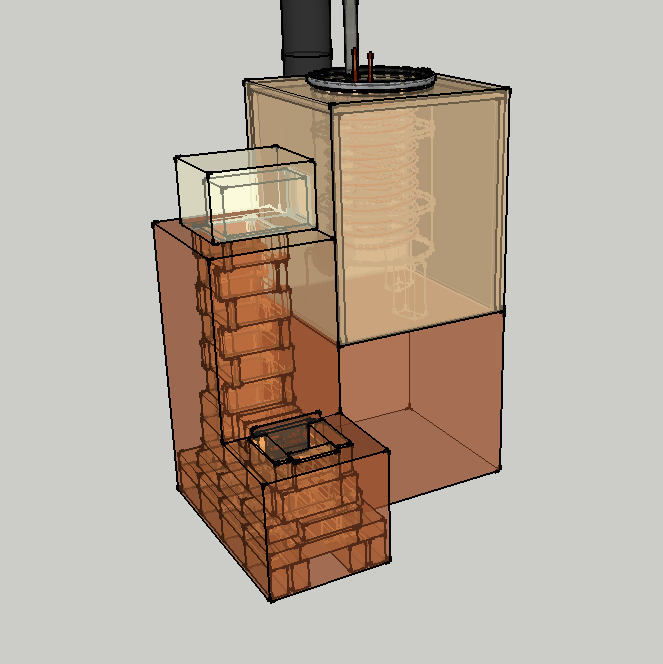 The images are taken from this Sketchup file. Credit goes to Tim Barker and Geoff Lawton over at Zaytuna Farm for pointing the way! Great design Donkey. I like her sunglasses. 1.what is the skin of the bell made of? 2.why is the bell set on a pedestal instead of extending to the floor level? Thanks! The figure comes with the software, NOT my doing. Nice image of a boiler..
That is of course, a classic piece of tech, built by a company or persons who are highly trained. That boiler also requires a host of other pieces, built by similarly qualified individuals, to insure it's safety and reliability. This design is intended for novices, to be put together (from scratch) in spare time, without specialized tools. parts or knowledge. Look carefully! This design, if followed accordingly, doesn't require any safety parts (I'd use them anyway) beyond the design itself. All it requires is a water supply and faucet. Anything that can be insulated and handle a little bit of heat. While modeling this, I imagined heavy-duty hardware mesh, insulated with kaowool (or some such) and earth plastered. Seemed like the thing to do at the time. It's a compromise. My thinking is that the water tank should be elevated to get it closer to the generation of the heat and that the greatest surface area exposed to the heat should be the tank, not the bell. You may be correct. 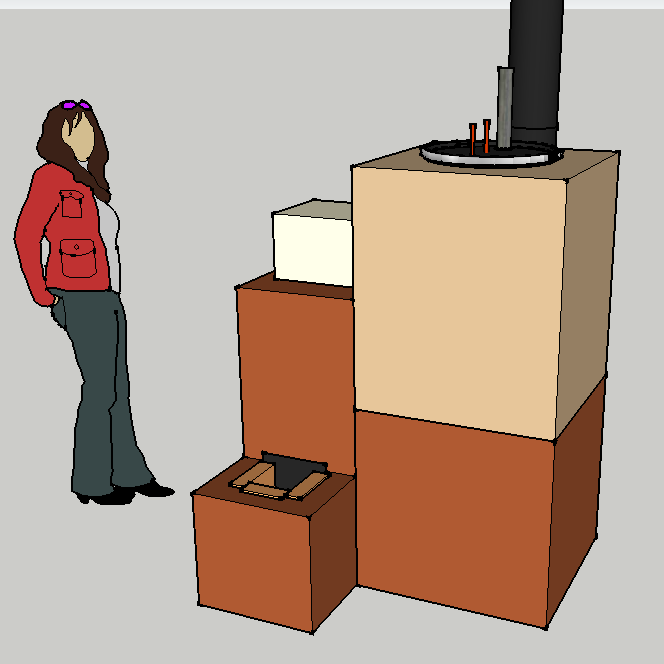 This is an early visualization, I have done no measuring or calculating yet. 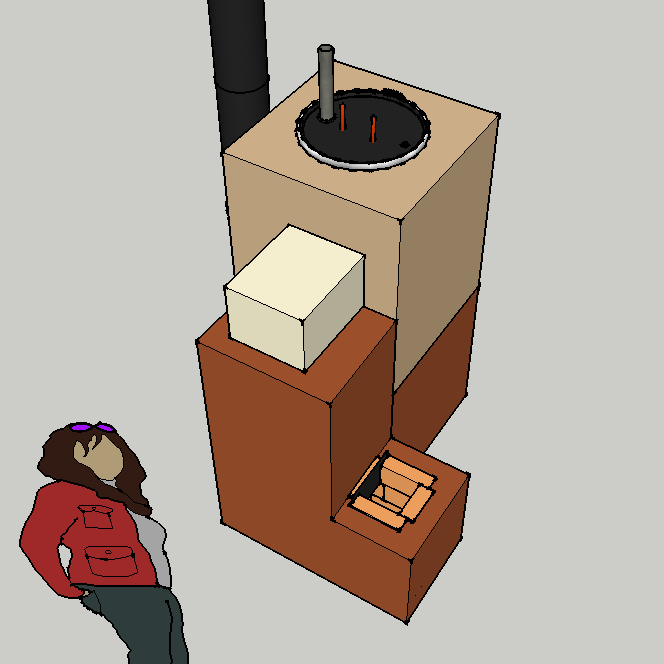 In the drawing, the stove is an 8 inch j-tube and the barrel is (supposed to be) a 30 gallon drum. 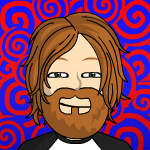 I got the drum from an on-line model library and haven't actually checked it's accuracy yet. Volumes, sizes, shapes, materials, methods, etc. are likely to change. Quick note though, I think that to work properly inside a bell, there should be a little space around the drum. This is why the bell might seem large. Just a guess..
Lovely concept mate. I agree its pretty safe. I would recommend a thermostatic mixing valve on the hot draw off point and a temperature/pressure valve as well, just in cade, but easy to fit and cheap enough. 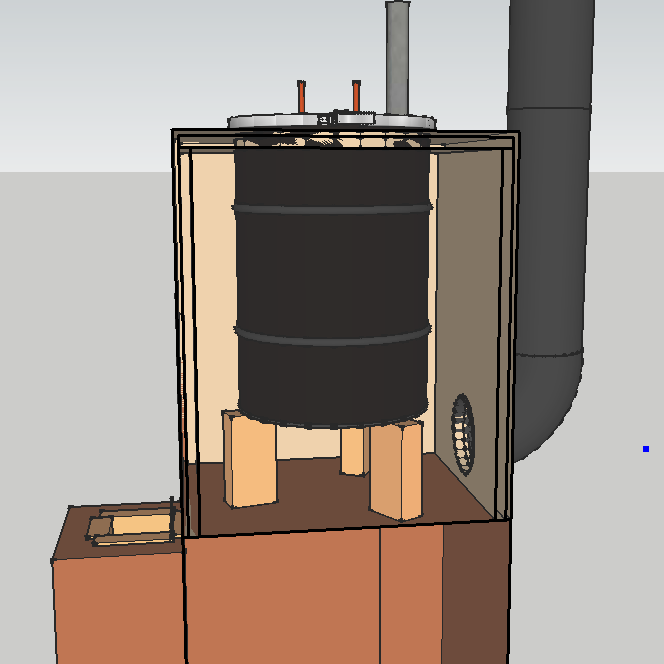 Also a toilet float and filler valve for the buffer water. 30 gallon drums are harder to find than 55(around here), but a 30 could fit into a 50, or inside a dryer drum(maybe). I like your focus on ease of construction.Efficiency is grand, but heating water with waste wood at 75%(made up number) is better than paying to heat it with fuel oil, electric, gas , etc. How do you keep the water in the barrel free of bacteria, etc? Fire (heat) should take care of the bacteria. A breather cap could be fitted on top of the vent pipe to reduce foreign material infiltration. Why is the top of the barrel exposed as opposed to being completely encased in the bell. 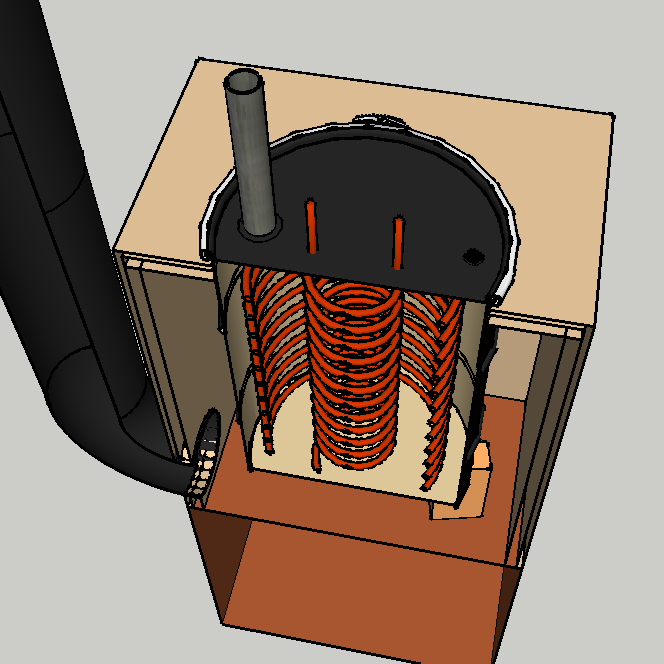 Presuming that it's metal, would not the exposed top of the barrel serve as a radiator to the outside. Do you think that concrete wallboard sealed with furnance cement could serve as the interior lining of the bell? Awesome plan. I have everything to do this except for the barrel. It's exposed for easy access. 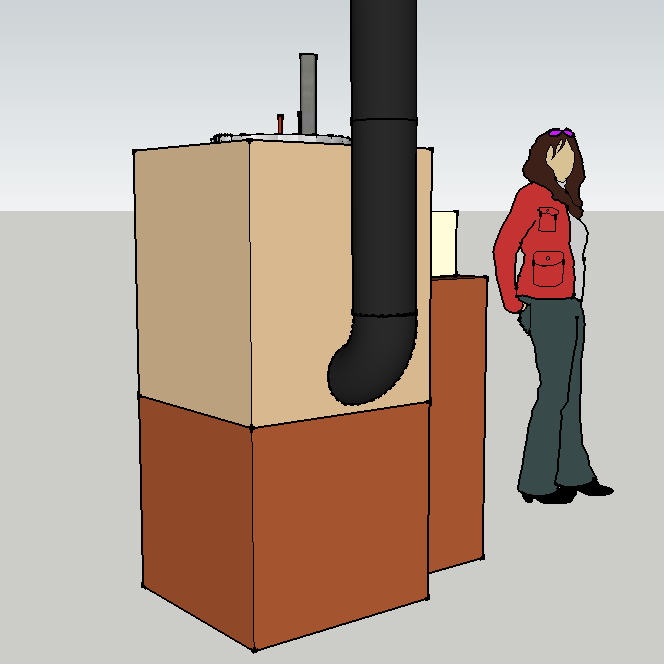 My thought was that some kind of insulating cap or blanket could be placed on top but I didn't model that. I think it's likely that it may be too hot for the concrete board as an INTERNAL liner, but it may be just fine as an OUTER liner, with kaowool (or some such) inside that. Well shoot.. Use a different container, like an old hot water tank or some other metal thing. Tube temperature will be lower than in the barrel. 1. The barrel buffer water isn't relevant because it's never supply water. Also it's likely to boil each time the setup is used so there shouldn't be long term exposure at ambient temperatures anyway. 2. Of course 140F water can scald. However, most people keep water rather cranked up and then mix at the faucet yes?